As longtime readers know by now, one of my biggest pet peeves is the lack of originality in Hollywood. One needs to look no further than this summer’s release schedule – which includes the fourth installment in the X-men franchise, a fourth Terminator movie, a Transformers sequel and a live-action G.I. Joe movie – to see that coming up with original ideas isn’t exactly at the top of any big name movie executives’ to-do lists. That’s why when writer/director David Spaltro offered me a chance to review his independent film … Around, I jumped at the opportunity. Spaltro pulled from his own experiences when writing … Around. It’s the story of a film student in New York named Doyle Simms who finds himself in financial difficulty and decides to live in Penn Station since he can’t afford a place to live and to take out 17 credit cards to pay for school. 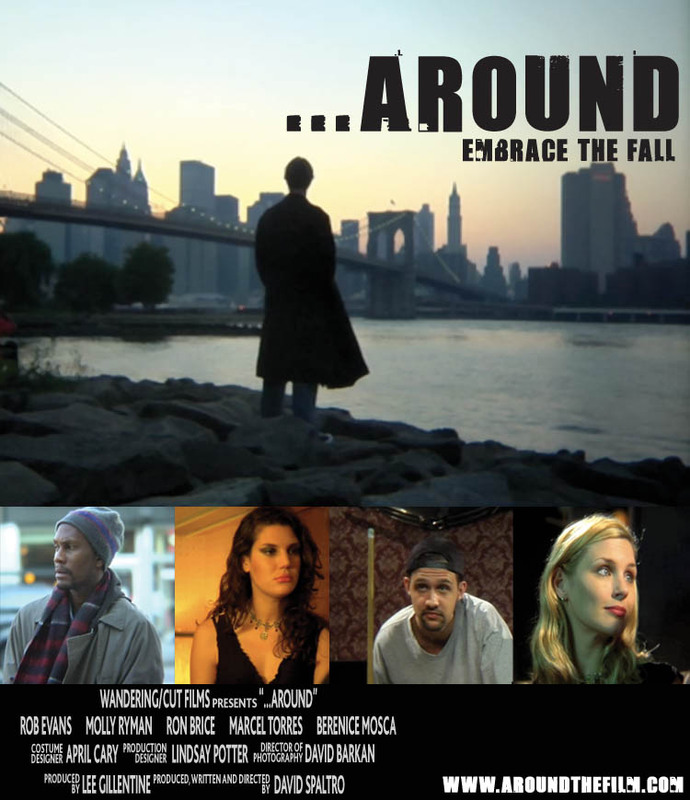 Along the way, he meets a beautiful girl who attends the same college as him and a homeless man who teaches him how to live on the street. He also continues to see people from his old life in New Jersey, including a best friend who attempts to keep him on the right path and a bitter mother who is rooting for him to fail. The strength of the film is its lead actor Robert W. Evans. Evans is a bit of a cross between Ryan Gosling and Ben McKenzie from The O.C./Southland. He brings a lot of charisma to the role of Doyle and as a result, you really end up pulling for the kid. By the end of the film you feel very attached to Doyle and you want to know what will happen next in his life. Molly Ryman plays Allyson, Doyle’s romantic interest in the film, and while I would have liked to see her character developed a bit more, she does a great job in the role and she has a unique beauty that makes her stand out in the film. She also has great chemistry with Evans, which helps sell their romance. It’s a shame that we don’t learn much more than surface information about Allyson, since it seems like if she was developed a bit more, she would have been a memorable character. Being an independent film, the supporting cast is a bit more of a mixed bag. Berenice Mosca does a good job playing Doyle’s cold mother and Veronica Heffron is quite memorable in her minor role as Veronica. However, Marcel Torres comes across wooden and often times unintelligible in his portrayal of Doyle’s longtime friend Logic. Ron Brice does an adequate job playing Saul, the homeless man who takes Doyle under his wing, but his character seems a bit clichéd at times. 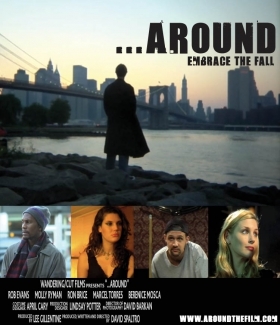 Overall, … Around is an entertaining film that certainly feels different from your standard Hollywood fare. At times it reminded me of the excellent independent film The Wackness, which tells the story of a New York teenager who sells marijuana to make ends meet and to escape his troubled home life. Both films have a strong male lead who goes to extreme circumstances to get by, which makes you root for both characters to find their way. My only real complaint with … Around is that at times it seems to shy away from showing the really traumatic parts of Doyle’s life. When Doyle begins living in Penn Station, he explains that he keeps his possession in a locker and sleeps on the floor, but Spaltro doesn’t really show us what that experience of living at the station is really like. There is a scene where Saul takes Doyle out to collect cans for extra cash and a scene where Doyle steals food from a convenience store, but that’s about all we get. I kept wishing that we would see more of that gritty side of Doyle’s life. However, Spaltro keeps the tone of the movie fairly light, although there is a very emotional scene with Doyle and his mother late in the film. While … Around is a bit rough around the edges, it has enough touches of greatness to keep you solidly entertained. It’s also quite clear that Spaltro put a lot of love and energy into making this film (which he shot in 21 days for $175,000, using 40 different credit cards to finance it). He proves to be a capable storyteller and Evans does an excellent job bringing Doyle to life. Both of them should hopefully have bright futures ahead of them in Hollywood. It’s refreshing to see the passion that both Spaltro and his main character Doyle both have for filmmaking. It gives a cynic like me hope that there are people out there who want to do something different than the standard remakes and sequels that Hollywood continues to produce. Let’s just hope that Spaltro doesn’t have to keep maxing out credit cards to make it happen. 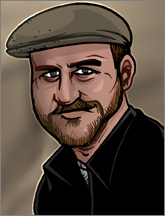 Joel Murphy is the creator of HoboTrashcan, which is probably why he has his own column. He loves pugs, hates Jimmy Fallon and has an irrational fear of robots. You can contact him at murphyslaw@hobotrashcan.com. This looks really interesting and in Australia I doubt i would have heard of it, so thanks for the heads up and I’ll keep an eye out for it. I am wondering how this compares to The Pursuit of Happyness as the stories at least have a similar theme. I’m getting a little grumpy about the movie prospects for the summer. Guess I’m going to have to work a little harder to find the good stuff. Think I’ll add this one to the list of movies to check out. Thanks for helping me be lazy and not having to find movies on my own. Lee, I am ashamed to admit that I have never see The Pursuit of Happyness, so I can’t really compare the two. Perhaps I will Netflix it.